I like them. Knopf does it a lot. As the story below, from The Economist‘s website, shows lots of people think deckle edges are a defect. Now, it is a truth universally acknowledged that if book buyers don’t really want a book they have bought, there are multitudinous “excuses” they will dream up in order to return it for credit. (Obviously the world out there doesn’t know that book publishers often seem more eager to accept a return than they are to force the book on you in the first place!) We’ve all experienced books being rejected for all sorts of silly reasons. Unfortunately it begins to appear that electronic retailers are joining in the silliness too. Hey, we love our books, so just send them on back. GO TO your bookshelf, assuming you have one, and pull out a hardcover book. Is the cut edge smooth? Try another until you spot rough-edged pages. Now ask yourself: does this book impress you more than others with trimmed pages, or does it seem defective? Some of Amazon’s customers clearly think the latter, to judge by a note found on the bookseller’s pages for books with this “feature”. An artefact of bygone days, the “deckle edge” is part of the modern fetishisation of the past, much as Instagram glorifies the 1970s snapshot camera. An artefact that might have annoyed the makers of the day turns into a trait intended to evoke the whole experience and emotion associated with the original, but without any of the baggage. The deckle edge was unavoidable until the 19th century, a byproduct of the papermaking process. Since it became unnecessary, the rough edge gradually turned into a status symbol. Advertisements for books in the late 1800s are rife with mentions of a “deckle edge” alongside the fine paper on which a title was printed. But even that aspect has begun to fade as modern book buyers do not know what to make of it. Paper begins as a suspension of fibres in a water slurry that is drained through a screen. A frame temporarily placed around the screen to restrain the mixture in place is known as a deckle. A papermaker lifts the deckle after draining sufficient water and before pressing the paper with felt and continuing the process to a finished sheet. The deckle cannot make a perfect seal against the screen, and fibres seep under its edge, which creates the rough-edged pattern. Before the era of continuously produced paper, which began with the invention in the early 1800s of the so-called Fourdrinier machine, all paper had a deckle edge. That edge could be trimmed or not. Sarah Werner of the Folger Shakespeare Library says there appears to be no rhyme or reason in the books she has examined as to why one might be shorn of roughness while another reveals the papermaking process. Timothy Barrett, an expert on historical papermaking at the University of Iowa agrees. He says the fashion for deckle edges has waxed and waned, though the edges were mostly trimmed. The deckle edge is entirely separate from, and sometimes confused with, the roughness that occurs when a book is bound with “unopened” pages (often inaccurately called “uncut”). A reader used a paperknife to slit those pages, which result from leaving the folded printed sheets intact. There also appears to be no systematic rule as to why some books had unopened pages and others did not. The Fourdrinier machine removed the deckle edge. 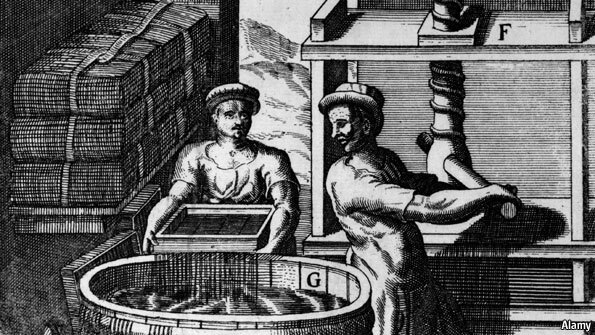 It made paper cheap to mass-produce, which in turn led to higher production runs of books and newspapers. (In a historical quirk, the French Revolution led its Gallic inventors to patent and build the original machine in Britain.) Paper was rolled out continuously using an ingenious series of loops of mesh screens and felt. A final stage typically trimmed the deckle edge, which the process had all but eliminated in any case, and the roll was cut into sheets. Presses that could feed continuous rolls or “webs” of paper came later, ushering in mass printed media. Over time, the deckle edge transformed from a cost-cutting measure, in which leaving it in place was cheaper than removing it, into a sign that a book was made from more expensive paper or using a more refined method. Your correspondent spent his teens and twenties in the printing and book worlds, and even as late as the 1990s a sniffiness prevailed about sheet-printed books versus those printed on continuous presses, a similar vestige. Babbage also recalls buying hard-cover books in cheap book-club editions in which the deckle edge was a must, to try to offset the impression made by poor paper quality, binding and printing. The modern deckle edge is cut by a machine that scarifies the edges of a book in an ostensibly random—and rather pretty—fashion. In 1948 Dard Hunter, a paper historian, noted that the Eynsford Mill in England, for example, produced “genuine handmade, imitation handmade, and Fourdrinier machine-made”, each appealing to the differing needs of publishers and printing firms. Amazon’s note is meant to reassure buyers disturbed by a deckle edge that the artifact is not a flaw. Ironically, making a book dearer by design seems to have made it appear damaged in the eyes of readers who lack the supposed sophistication to appreciate the fakery of a handmade past. I hate deckle edged books. The pages are much harder to turn! Well yes, though much better than the old days (which they are trying to echo) where you had to read with a paper knife in hand, cutting the pages apart yourself as you went. But I think some books might benefit from slower reading, so maybe it depends on genre. Perhaps some publishers are overdoing the nostalgia touch? True. I’ve actually run into some books that I had to use a knife opener on some of the pages because they weren’t cut. But for me, a slow reader, the frustration for trying to turn the page negates the benefit of slower, thoughtful reading.